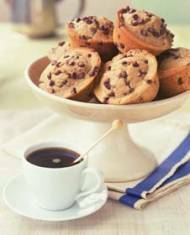 Here's a great recipe for Chocolate Chip muffins that includes several delicious variations, such as apple, blueberry and lemon. Choose a different variation to make for your family every week. They will love this new tradition you've started and will look forward to your next new muffin variety. 1. Heat oven to 400°F (200°C). Grease bottoms only of 12 muffin cups or line with paper baking cups. 2. In medium bowl, combine flour, sugar, baking powder and salt; stir in chocolate chips, mix well. 2. In small bowl, combine milk, oil and egg; beat well. Add to flour mixture all at once; stir just until dry ingredients are moistened. (Batter will be lumpy.) Divide batter evenly into greased muffin cups. 3. Bake in preheated 400°F (200°C) for 20 to 25 minutes or until toothpick inserted in center comes out clean. Cool 1 minute; remove from pan. Serve warm or at room temperature. Decrease sugar to 1/4 cup; add 1 teaspoon cinnamon to flour. Stir 1 cup finely chopped, peeled apple into dry ingredients. Substitute apple juice for milk. Bake at 400°F (200°C) for 18 to 22 minutes. Stir 1 cup fresh or frozen blueberries (do not thaw) and 1 teaspoon grated lemon or orange peel into dry ingredients. Before baking, sprinkle batter in cups with a combination of 3 tablespoons sugar and 2 tablespoons brown sugar. Place 1/2 teaspoon any flavor jam on each muffin before baking; press into batter. If desired, sprinkle with finely chopped nuts. Add 1 tablespoon grated lemon peel with flour. Add 1 tablespoon grated orange peel with flour; substitute orange juice for milk. In a small bowl, combine 1/4 cup firmly packed brown sugar, 1 tablespoon softened margarine or butter, 1/2 teaspoon cinnamon and 1/4 cup chopped nuts or flaked coconut; stir with fork until crumbly. Sprinkle evenly over batter in cups before baking. After baking, brush tops of hot muffins with 2 tablespoons melted margarine or butter; dip in mixture of 1/4 cup sugar and 1/2 teaspoon cinnamon. Use 1 cup all-purpose or unbleached flour and 1 cup whole wheat flour. WAY TOO much baking powder. It should be 2 tsp. at most. I really wish I had read the reviews of this recipe before I set out to bake these muffins. This is simply a poorly executed recipe. Far too much baking soda and flour, ingredients which make up the majority of the flavor and leave the muffin extremely dry. You would be far better off with a bagged mix. Very very good. I put a bit of vanilla in them and sprinkled some cinnamon on top so I would totally suggest that. I've made the most delicious muffins EVER !! They were GREAT!! Thank you, thank you. Thank you so much for this perfect recipe! So good and easy to make, yummy! The muffins were great. I found that I needed to add a tablespoon more milk as the batter was too stiff. But that's all it needed. it turned out as a disaster. had no flavour, i realy should have read the comments.